The foyer is where you come from your outer world to your inner world. You want to make your foyer inviting, no matter what size area you have. The art of feng shui brings together a wonderful mix of good interior design, the Chinese five element theory, Taoist principles of yin and yang based on the I-Ching and ancient folk wisdom from China. At its very core is the belief that all things on the planet are imbued with life-source energy, or chi, and that everything embodies consciou­­­­­sness, along with the notion that we as humans are continually interacting with all we encounter. It either nourishes or inspires us — expanding and increasing our energy or doing the opposite by bringing our energy down. Our homes are a compilation of their contents and the energies of past and present occupants. Since we spend much time at home, the way we interact with the energy there is considered to have a powerful influence on our lives — affecting our relationships, careers, prosperity and health. Creating a home that supports, uplifts and nurtures us is tantamount to creating a happy and balanced life. Most importantly, the front door to a home is considered the mouth of chi. The next most important place is the foyer, which is a transition place, and it must not be overlooked. The foyer is where you come from your outer world to your inner world. You want to make your foyer inviting, no matter what size area you have. The foyer is a space that stops chi from flooding into your home. Think of it as a place that creates a positive impression for all who enter. It is an area that allows you to pause and reflect, lift your chi, and inspire you and any others who enter your space. • Place some lovely artwork in this space. 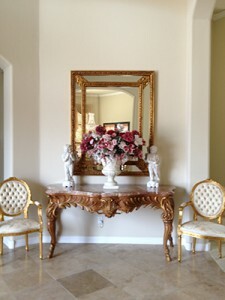 • Place a beautiful table with a lovely, live floral arrangement in the foyer. • Hang a special mirror, making sure that it is not placed across from the front door. • Try to somehow mark where it is you want people to go. Directional artwork can accomplishe this. • Use the five elements of earth, metal, water, wood and fire by representing their colors or by placing symbolic objects in the foyer. These tips can create an inspiring environment for your foyer, thus providing a sense of well-being and peace for you, your family and all who enter. Joy Abrams, M.A., FSII, is a feng shui and yoga master and an international author who gives feng shui consultations. 602-791-5223, www.aaafengshuiandyoga.com or www.empowermentwithjoy.com.